As most companies know, finding unique ways to motivate a sales or service team can be a constant challenge. These roles can operate under considerable pressure, and the occasional off day or slump is inevitable — whether from business cycles bumping into a prospect’s holiday stretch or vacation time, lack of consumer interest, product hiccups from an early launch or drained employee morale. When productivity is under the bar, a sales or service contest can reignite the spirit and performance amongst team members. Because these types of professionals tend to be competitive by nature, the drive to outperform colleagues and be recognized by peers are powerful motivators. Internal leaderboards and competitions benefit and are quite impactful to businesses of all industries, business models and sizes. When done correctly, they support sales initiatives, service goals and inspire individual performance improvements. They can foster collaboration, drive revenue and even go as far as to improve patient care processes within nursing communities. All that being said, poorly designed competitions can sometimes do more harm than good. Pitting the same people against others of different performance levels and using contests to focus on only negative behaviors can hurt morale, for example. Luckily, you shouldn’t have to worry about those or other negative effects; just take a minute to read these 5 refreshers on sales contest best practices and keep them in mind when developing your next internal competition. It’s critical that there’s an element of simplicity to your competitions. Identify one or two behaviors that, when increased, will lead you to a specific goal you want to accomplish. Create contests around those behaviors. This will helps keep teams focused on those behaviors, which is ideal because they’re being pulled in several different directions every day. Having short-burst contests creates a sense of urgency and focus within your team. The one-off Winner’s Circle or President’s Club type of competitions are okay, but remember that anything over 30 days typically loses momentum. We’ve even seen one-hour-long competitions work well! This is critical when running team-wide competitions — be sure to engage your top leaders. Call on your top executives to chime in via a platform like Salesforce Chatter, or even email, to provide those “attaboy/girl” comments, or to ask top performers to be vocal in sharing their best practices. Once your reps see that leadership is watching, they’ll understand that the contest is more than a game. Consider segmenting sales contests between different teams, roles and performers. The smaller the groups, the better. This allows everyone to feel they’re in the game, minimizes frustration from those still growing professionally and adds extra competitive push to the top performers. Selecting the right incentive can help sweeten the pot, but it’s just one of several things that make a competition successful, and even bragging rights can act as a good motivator. Check out this free “Sales Incentive Ideas” eBook for a few unique and cost effective incentives you can offer your team. 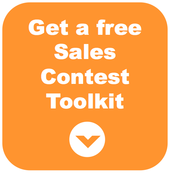 If you’d like more ideas, get a free copy of our “Sales Contest Toolkit.” In the meantime, these five best practices are a great place to start. When a sales contest is carefully designed, it makes all the difference. Make sure to leverage these 5 best practices with your internal competitions.